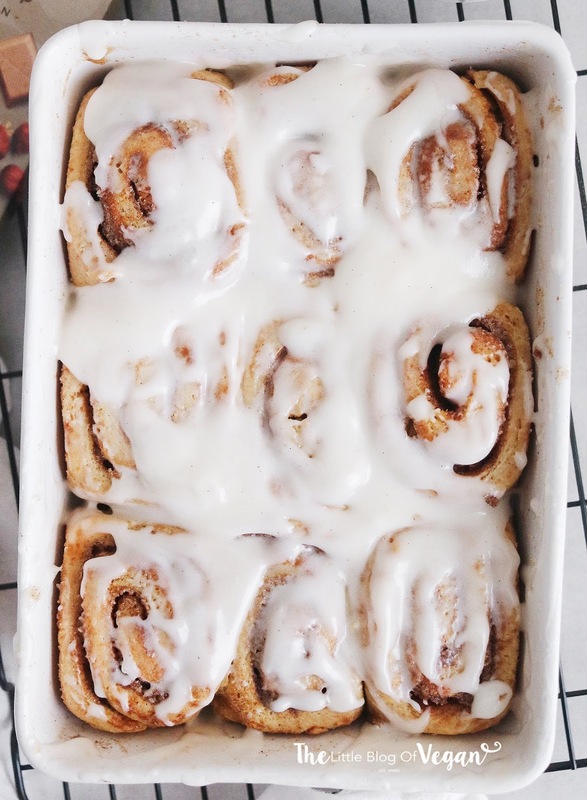 Light, fluffy, moist and delicious are the main words to describe these warming cinnamon rolls. I'm a sucker when it comes to mixing savoury with sweet. I absolutely love the combination of a savoury breaded roll, with a sweet filling. 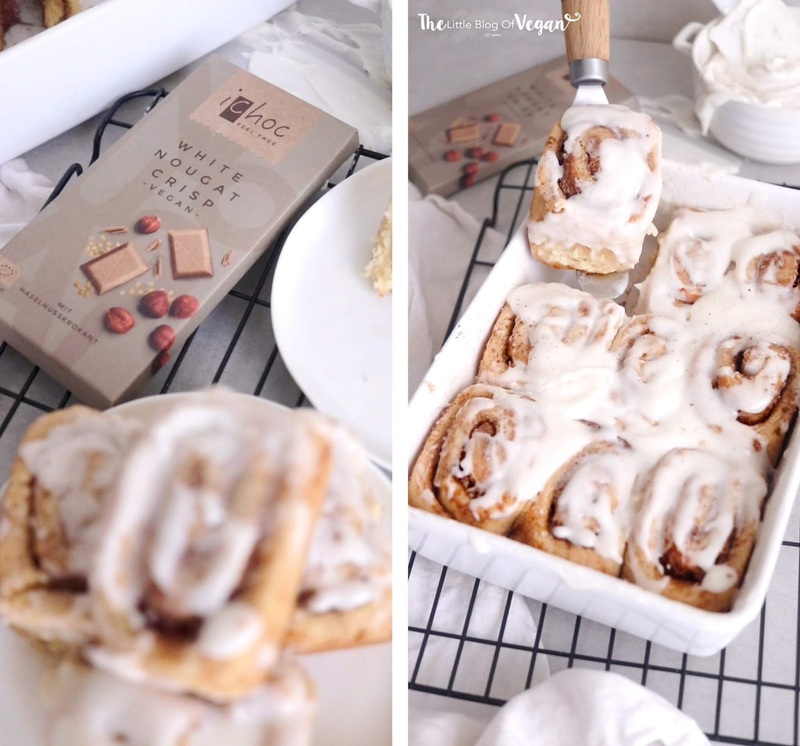 In this case, I used cinnamon with iChoc 'White Nougat Crisp' chocolate. 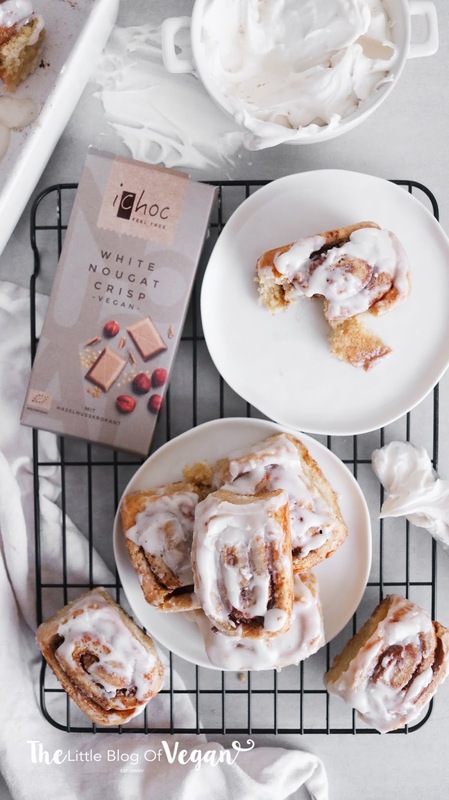 No words can describe how insanely delicious the 'White Nougat Crisp' chocolate bar is. 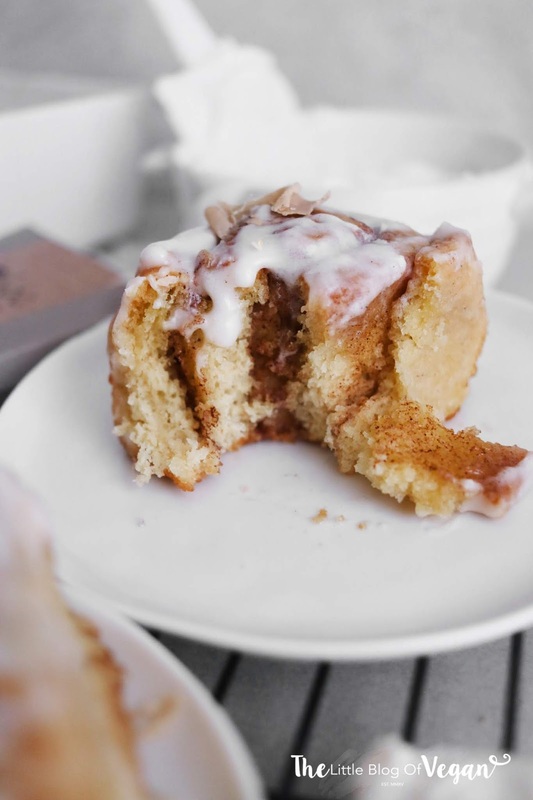 I just knew I had to use it in a cinnamon roll recipe! The White Crisp is my favourite by far. It reminds me of a Kinder Egg, which used to be my favourite chocolate as a child. The texture of the creamy chocolate and crunch of the hazelnut crispies is just scrumptious! LOVE this chocolate! I highly recommend it for everyone to try, vegan or not...I'm sure you'll love it! Here you go, prepare your tastebuds...you're in for a delicious ride! Step 1- Place the dairy-free milk and butter into a saucepan and heat until melted. Step 2- Pour into a bowl and sprinkle in the yeast then mix. Pop into a warm place and cover with a tea towel for the yeast to activate. This will take around 15 minutes. Step 3- Once the yeast is foamy, add in the sugar and mix until combined. Step 4- Add the flour to the yeast mixture a little at a time until sticky dough forms. Step 5- Knead on a lightly floured surface for a few minutes until a smooth dough forms. Step 6- Place into a lightly oiled bowl and cover with a clean tea towel. Place in a warm area for approximately 2 hours to rise. You want it to double in size. Step 7- Flour a clean surface and roll out the dough into a rectangular shape. Step 8- Mix the butter and vanilla bean paste together, then spread all over the dough. Step 9- Sprinkle the cinnamon, sugar and grated chocolate over the butter, making sure it's even. Step 10- Starting at a long side, roll the dough into a log, pinching it as you go to keep it rolled up. Step 11- Once in a log, using a knife or string, cut into 1 - 2-inch rolls. 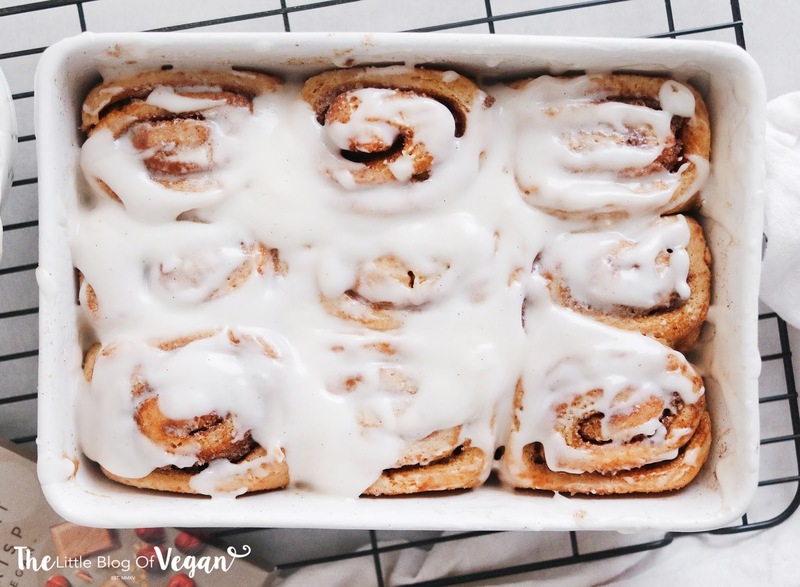 Step 12- Generously grease a square baking tin/ dish with melted butter and line up the cinnamon rolls, leaving space as they will rise. Step 13- Brush melted butter over each roll. Step 14- Cover with a clean tea towel and pop back into a warm area and allow to rise for 20 minutes. Step 15- Preheat your oven to 180 degrees c.
Step 16- Once the rolls have grown in size, pop them into the middle of the preheated oven and bake for 20-25 minutes, or until golden in colour. Step 17- Once baked, remove from the oven and set aside. Step 1- Place the icing, vanilla, cream cheese and milk into a food processor/blender and whizz up until smooth. Add as much milk as needed for a smooth glaze. Step 2- Smooth over the rolls until fully coated. 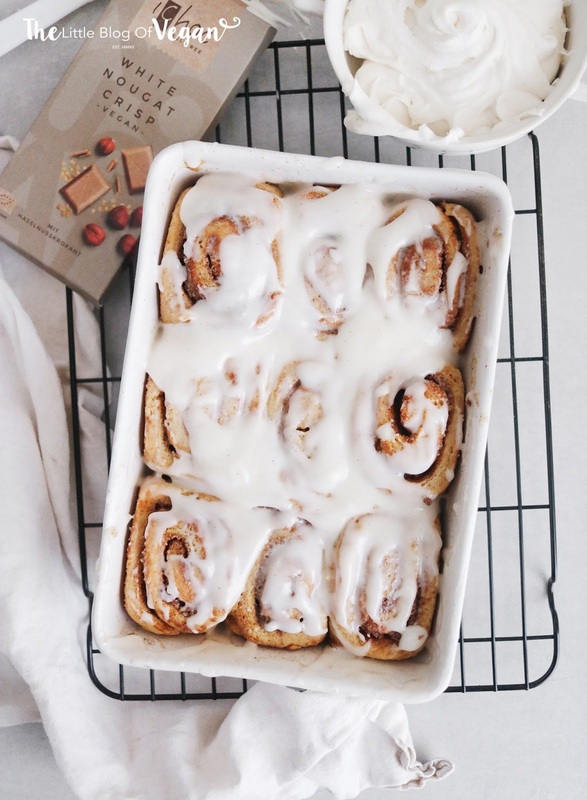 Serve the rolls whilst warm, with a drizzle of melted iChoc 'White Nougat Crisp' (optional). Best enjoyed warm, day of making.